Contributing editor Deirdre Lockwood notes that scientists have found greatly increased amounts of chloride in streams, lakes and rivers over the last few decades. One of the biggest culprits is salt that's deposited onto roads before and during snowstorms. The amount used in the U.S. has grown dramatically from about 4,500 metric tons in the early 1940s to 22 million metric tons now. But salt also comes from sewage, fertilizer runoff, mining operations and deteriorating structures. Not only does all of this salt makes water taste bad, it can corrode plumbing and cause health concerns. It also can affect freshwater organisms and disrupt ecosystems. Some scientists are calling for the U.S. Environmental Protection Agency to start regulating salts. Others are simply trying to bring more attention to this issue. And some municipalities are already implementing changes. In Madison, Wisconsin, crews apply brine, about a 20 percent salt water solution, onto roads before a snowstorm hits. With this approach, they have used about 70 percent less road salt. 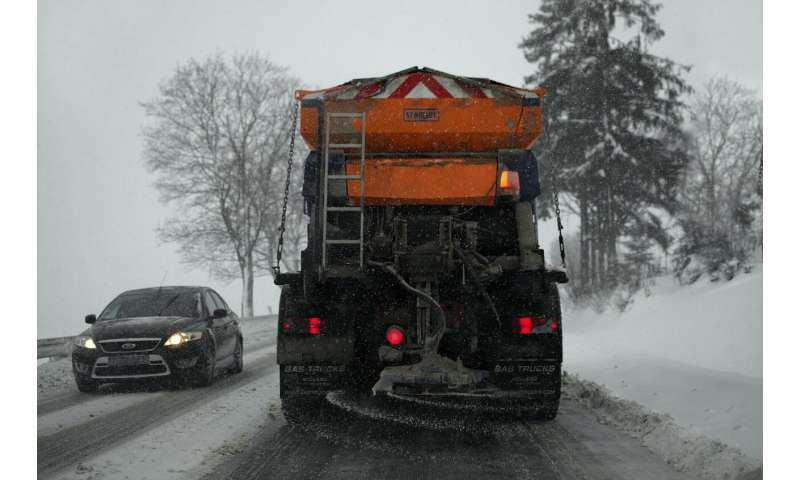 And the village of Lake George, New York, has reduced road salt application by about 30 percent with brine treatment and new, more effective snow plows.